This Ranch Chicken is so easy to make with just two ingredients that pack tons of flavor! Bake it in the oven or cook it on the grill! This Ranch Chicken recipe has been sponsored by Hidden Valley® and Glad®. All thoughts and opinions are my own. Summer is here, which means it’s time to take out the grill! 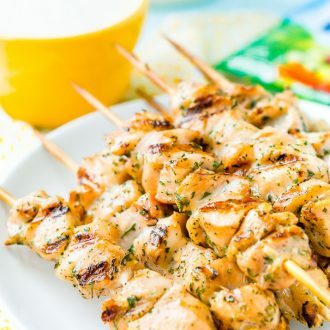 If you’re on the hunt for simple, delicious grilling ideas that your whole family will love, you’re going to want to stay tuned for this Ranch Chicken recipe! Do you ever get in a “dinner rut” where you feel uninspired and just keep making the same few recipes? If this sounds like you, you’re going to want to put Ranch Chicken in your meal rotation. The ingredients for this recipe are chicken breasts and a Hidden Valley® Ranch Dry Dips Packet. Yep, that’s it! Okay, so you may need a few extra things, like skewers, a roll of Glad® Press ’n Seal®, and some Hidden Valley® Original Ranch Dressing. 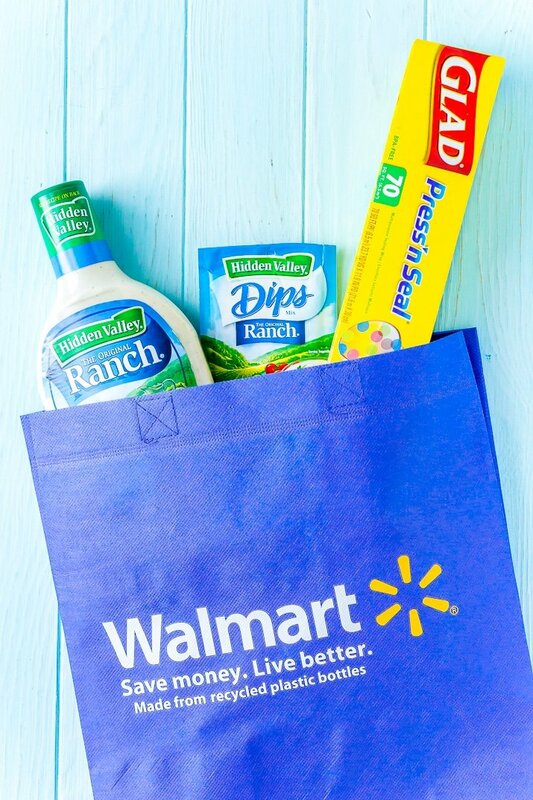 But luckily, Walmart is your one-stop shop for all these items… unless they’re already in your kitchen! JUST TAKE ME TO THE RANCH CHICKEN RECIPE ALREADY! 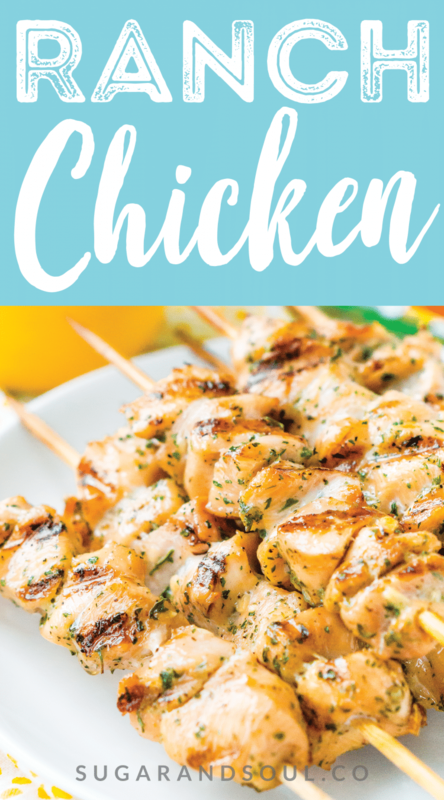 If you’d rather skip my (very helpful, I think) tips and tricks, essential cooking info, and similar recipe ideas – and get straight to this deliciously easy Best Ever RANCH CHICKEN Recipe – simply scroll to the bottom of the page where you can find the printable recipe card. To make this recipe, cut the chicken breast into chunks and put them in a bowl. 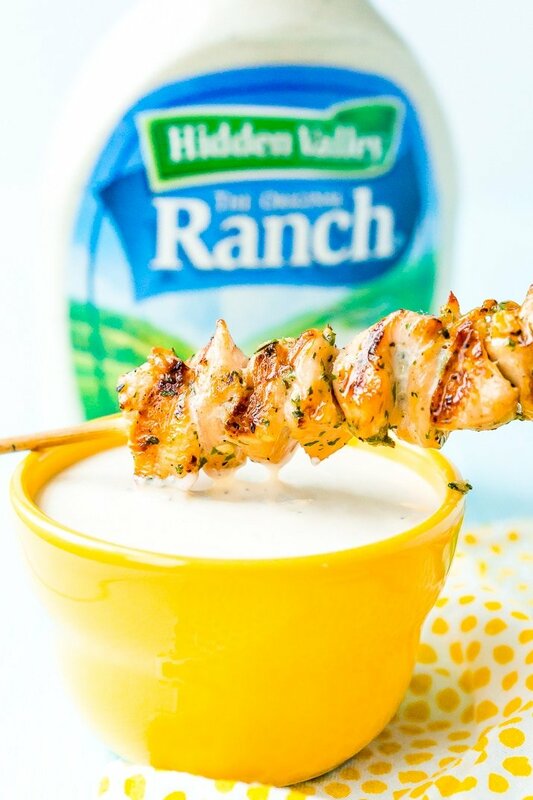 Sprinkle a Hidden Valley Ranch Dry Dips Packet over the meat, cover with a sheet of Glad Press ’n Seal, and shake! 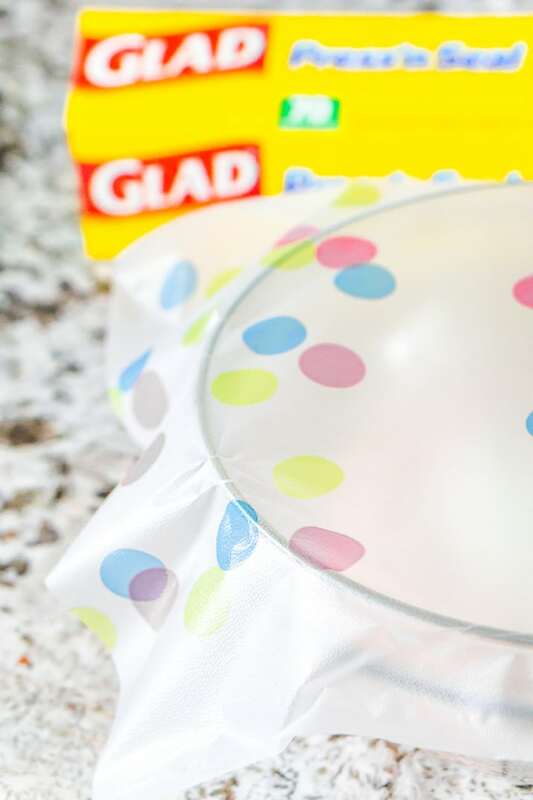 I often use Glad Press ’n Seal instead of traditional saran wrap because its Griptex technology helps it adhere to just about any container. This creates an airtight seal that prevents spills and messes, even when you’re tossing around chicken in a pile of spices! 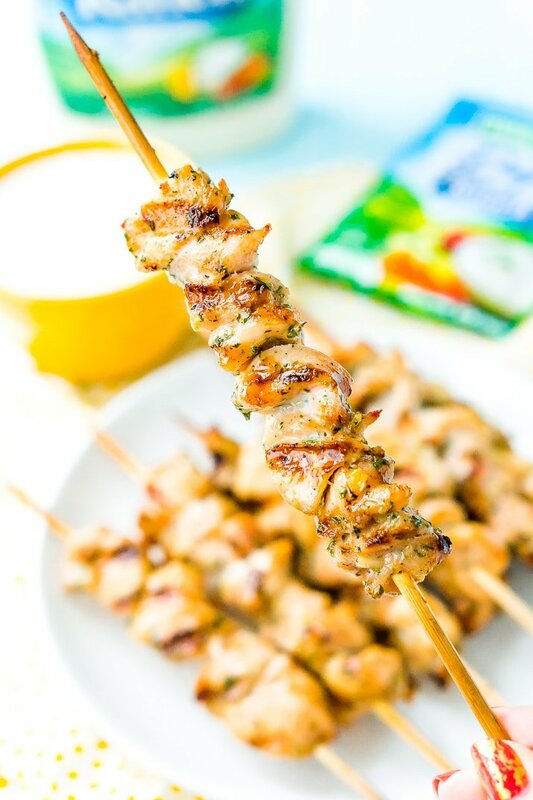 Once the chicken pieces are evenly coated, slide them onto skewers and grill. 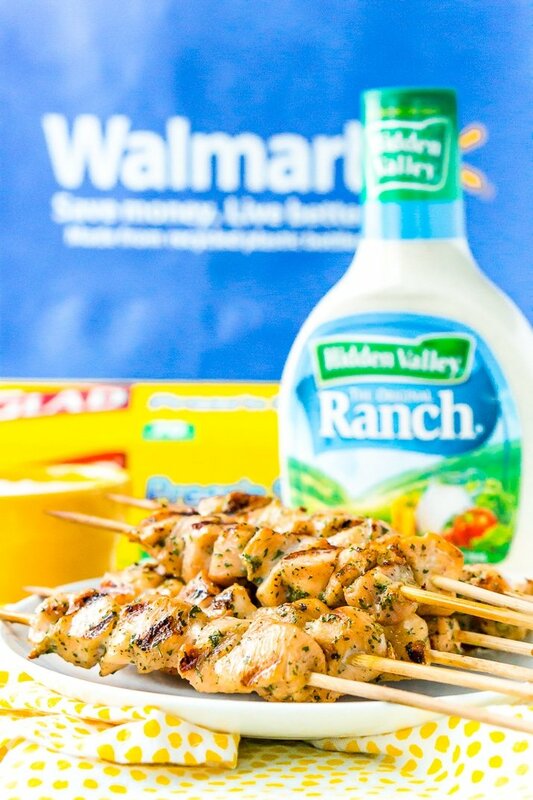 If you don’t have skewers, your other option is to keep the chicken breasts whole and rub the dry ranch mix on by hand. You can even bake them in the oven instead of on the grill! The result is juicy, tender chicken full of zesty flavor that you can serve as an appetizer, on top of a salad, or with a side of grilled vegetables. As a matter of fact, you can use Hidden Valley Ranch Dry Dips packets to spice up veggies like zucchini, mushrooms, and peppers, too… it’s not just for dips! 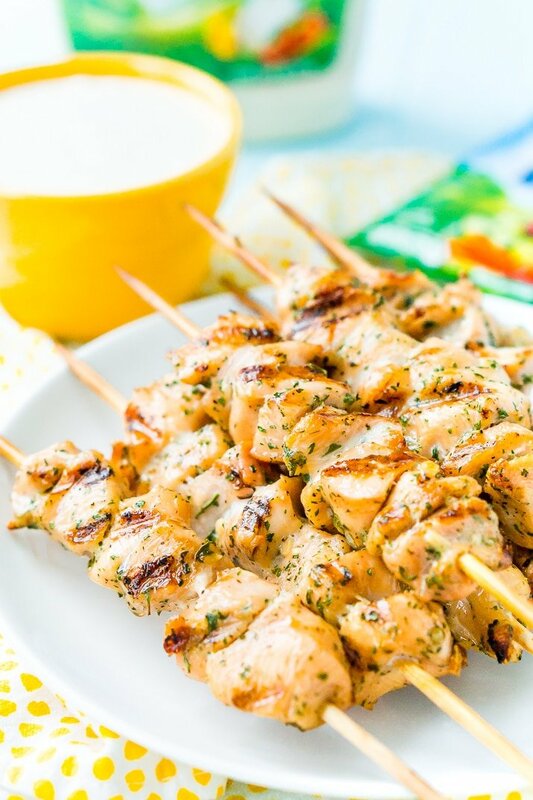 When we host cookouts, I love serving Ranch Chicken skewers as an easy-to-eat appetizer alongside Hidden Valley Ranch dressing for dipping. You can also make a killer Cobb salad with this chicken, adding bacon crumbles, hard boiled eggs, avocado slices, cheese and—you guessed it—a creamy drizzle of Hidden Valley Original Ranch dressing! If there are any Ranch Chicken leftovers (big emphasis on the “if”! ), I use Glad Press ’n Seal to make sealable pouches to store the kabobs or cover any full serving bowls. When you cook as much as I do, you look for products that are versatile, and this stuff is my hack for making meal prep and storage easier. Whether your schedule is packed or you’d just rather spend more time relaxing than cooking, the key to summertime meal planning is to keep it quick and easy. In addition to its bold flavor and short ingredient list, I love this recipe because you can pick up everything you need right at Walmart… and let’s face it, you do most of your errands there anyway, right? Summer is about enjoying the weather and making memories with loved ones. With this crowd-pleasing Ranch Chicken recipe, you can spend less time cooking and shopping, and more time on what matters most! Pin this Ranch Chicken Recipe for Later! Preheat your oven or grill to 350 degrees F and either rub the grill grates with olive oil or spray a cooling rack with non-stick spray and place on a baking sheet. If you're using wooden skewers, place them in water to soak to reduce the risk of catching fire. 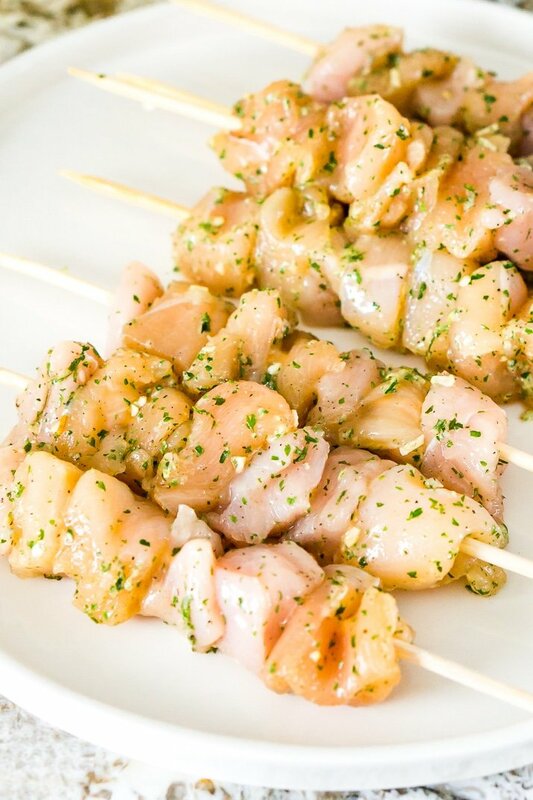 Cut the chicken into 1 to 1 1/2-inch chunks, cutting away any excess fat. Place the chicken chunks in a medium bowl. Add the Hidden Valley Dry Ranch Dips Mix to the chicken and seal the bowl with Glad Press 'n Seal. Shake the contents until the dip mix has evenly coated the chicken. Add the chicken to the skewers and arrange on the grill or on the cooling rack on the baking sheet. Cook for 25 to 30 minutes until the internal temperature reaches 165 degrees F, turning at least once halfway through. Serve with Hidden Valley Ranch Dressing for dipping or add the chicken to a fresh garden salad and toss with Hidden Valley Ranch Dressing. I was really excited to try this recipe for a dinner party. Followed the recipe. Very unpleased, you get a hint of ranch that’s it. If you want FLAVOR you need to add salt & pepper otherwise you get very very bland chicken. I will give this recipe another try but only by adding another pack of ranch, salt & pepper.